After finishing The Inspector which I blogged about in Part 2 of this series, I moved on to Part 2 of the tutorial which is all about “Organisation.” No, I didn’t spell that wrong. I have yet to mentioned that Scrivener using UK spellings for quite a few words. In the introduction to this next section, they even say “learnt.” Ugh…I cringed when I read that! The first part of this section just teaches you about how to add files and folders and to convert between the two. Scrivener even shows you how to change the icon next to each folder and what they each represent. There’s a plain folder, a piece of paper in the folder, and also a stack of paper. I don’t really think this would be very useful to me, but who knows. I guess I’ll find out when I actually start using it. Outliner mode shows your file in…you guessed it….an outline. It shows you the title of each document, its synopsis, it’s label, the date it was created, the date it was last modified, and its label (you can label it as a Chapter or Concept, etc.). “Scrivenings” is the term for Scrivener’s combined text mode. It allows you to view or edit multiple text documents as a composite—as though they were one long document with dividers in between each documents. But you have to at least have subdocuments to use this mode. It basically makes working on a long text easier by allowing you to break it up into smaller pieces, while still being able to see how those smaller pieces fit into the greater whole. You can also choose to view your document as a split either vertically or horizontally. I thought this was a pretty cool feature. What this means is that maybe you are half way through a document you are working on but you need to go back up to the top to check something or even copy something from the first page. You can split your document and it opens it up in another window on the same page which you can use to scroll through while keeping your place on the original document. You can also use one of these split panes to open up other files, and continue typing in the other pane if needed. Pretty neat if you’ve collected research for your work and need to access it. You don’t have to open multiple windows and worry about downsizing windows or even accidentally closing them. 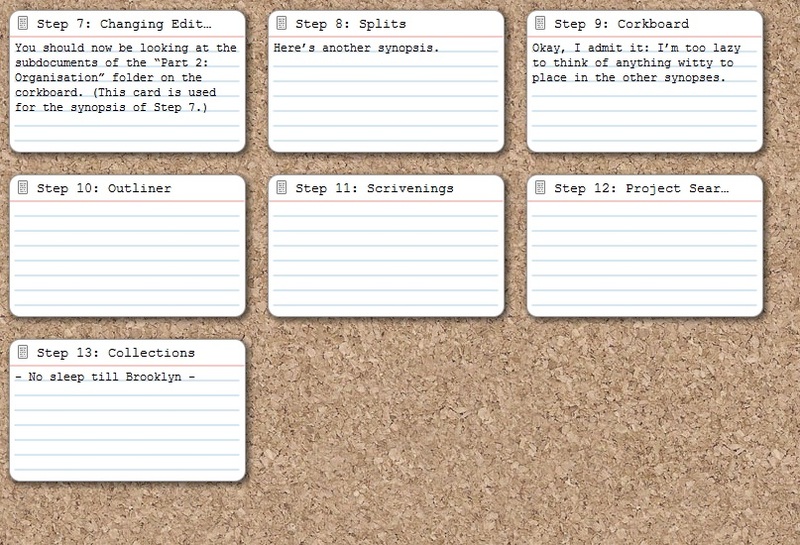 The next four steps are indepth looks at the corkboard, outliner, and Scrivenings mode, showing you how to use them better and even how to customize each. For example, in corkboard mode you can change the size of the cards if they aren’t big enough. In outliner mode, you can customize the information you see in the outline – adding or taking away. The Organisation step wraps up by teaching you how you can search your document – pretty basic stuff using a too bar at the top right where you can have it search all or can have it just search titles, characters, labels, etc. And that’s it for Part 2. Part 3 which I’ll discuss in the next part of this series moves on to Importing, Exporting, and Printing features so it appears we are hopefully closing in on the end.